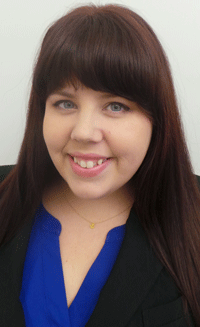 Get to Know Our New Career Development Services Counselor—Introducing Leslie Ballway! At Peirce, we pride ourselves in equipping working adults with the real world skills and career advice that they need to successfully navigate today’s workplace. Joining us in this mission is Leslie Ballway, the new career counselor working in Career Development Services! You may have seen Leslie on campus or in the CDS office, but we wanted to officially introduce her on the blog, just in case you haven't met her yet. Q: Leslie, please tell us a little bit about yourself. A: Hi! I'm Leslie, I’m the (somewhat) new career counselor in CDS. I joined Peirce after spending over seven years in workforce development. I’ve also worked in Law & Information Technology, so I have some background in fields that our Peirce students might be interested in. My real specialty is in coaching students towards identifying (and achieving!) their dream career. Q: How long have you been a member of the CDS team, and what important things have you learned so far? A: I joined the CDS team back in November of 2015. Probably the biggest thing I’ve learned is that Peirce people are truly special—all of the students and staff have been so welcoming and warm. I’m really enjoying getting to know the students, and helping them realize their career goals. Q: What's the best piece of advice you’ve learned in your own career that you impart to students? A: When I’m counseling students on their next career step, I always remind them how important it is to step outside of their comfort zone. That’s definitely something I’ve learned along the way. It might be uncomfortable, but when you take that scary first step and jump into something new, that’s when you find success, and you also grow the most both professionally, and as an individual. Q: What's your advice to students looking for jobs and internships? A: Quality is more important than quantity! You can focus on sending out one hundred resumes, and you might get zero responses—or, you can focus on sending out ten resumes and aim for ten responses. You’re more likely to get a response if you really take your time and customize your resume and cover letter for the job that you’re applying for. Also, invest the time in learning a company’s language; what are their values, what’s their company culture like, what do they value most in their current employees. It might seem like more of an investment of your time, but you’re much more likely to get a response if you do the research and incorporate those details into your initial outreach; the investment will pay off. To make an appointment for a one-on-one career counseling session with Leslie, email cds@peirce.edu. For more information on Peirce College’s career development services, click here.